There’s no longer any reason to use traditional forms to make an insulated cast in place concrete foundation. Polycrete engineers have developed oversized Big Block ICFs that can form concrete foundation walls up to 24” thick. This innovation saves the contractor time and money. You don’t have to handle traditional forms anymore. 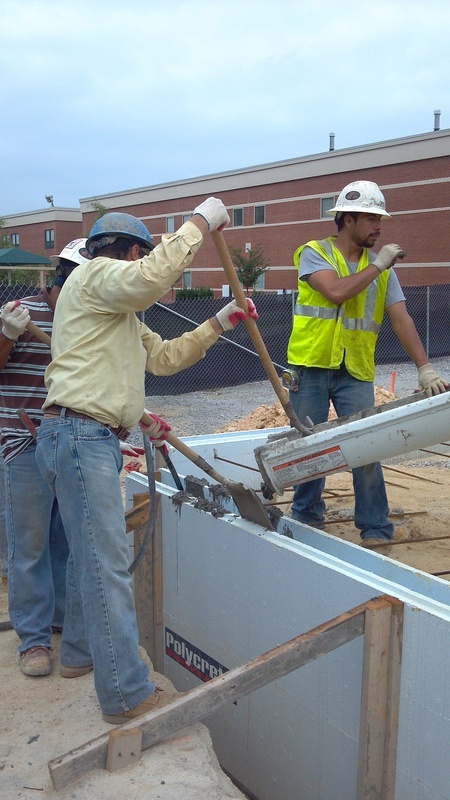 Polycrete Big Block ICFs are delivered directly to the jobsite. Since the form is the insulation, you’ve just eliminated another step. With the new Polycrete Split Block, you can even mix and match panel heights on each block. A 24” panel on the outside and an 18” panel on the inside lets you do a monolithic pour and run the slab right into the wall without any thermal breaks. Cuts jobsite waste too. Polycrete foundations are a great way to get your feet wet with ICF technology. If you're like most construction professionals you tend to take new products and systems one step at a time and salesman's claims with a grain of salt. Even though Polycrete's been around since 1988, if it's new to you, then it's new. We get that. Call or email us today. We’ll help with your take off and show you how you can save some time and money right off the bat.